The hip is where the leg and pelvis meet. The pelvis is anywhere a pair of brief-underwear covers, so the hip is right below that. The front of the hip is at the crease of the groin, the back of the hip is right below the roundness of the buttock. If you rub your fingers along the outside of the very upper outer thigh, you will come across a bump, which is the greater trochanter; the outer hip is just above that bump. The muscles directly above the hip are the main muscles that control the hip, so quality physical therapy should address all of them. STRENGTHENING: The muscles on the side of the pelvis/hip are probably most important for standing and putting weight on the leg, so they need to be strong. If you are doing sidelying leg lifts, the muscles just above the hip should be doing most of the work (not the muscles in the groin, not the muscles below the hip, and definitely not the outer calf). STRETCHING: I have found that most people are very tight in the groin muscles (psoas, iliacus, obturator), and almost always those muscles need to be released or stretched in the presence of hip pain. Sitting for prolonged amount of time can cause these front muscles to become tight. With good walking, the leg has to go behind the rest of the body, which it can’t do if those muscles in front are tight. 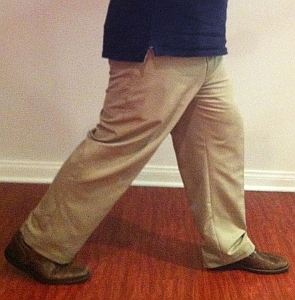 So this stretch can really make walking easier, especially after prolonged sitting in a car or after watching a movie. SITTING: Avoid sitting in low chairs, soft couches or a low toilet, which puts all of the weight on the pelvis/ hips/ tailbone area. This is stressful on hips and makes it difficult to get up. Instead, distribute the weight amongst the whole backside (sitting bones, back of thighs, etc.) by sitting on higher chairs, or place a pillow under your hips to make your hips higher than your knees (this can be especially helpful when driving). It may also be helpful to get a raised toilet seat. Also, make sure your feet touch the floor to allow the whole lower half to create a solid foundation for you. If the transition to get up from a chair hurts, try sitting on the edge of the chair, spread your legs, and tilt your pelvis forwards and backwards several times to warm up the joint. Or scoot forward to the edge of the chair, and allow your leg to slide back under the chair as you use your abs to make sure your trunk stays elevated. Separating out the abdomen and the leg in this way should help stretch the groin and front of the thigh, which may help ease the motion of the leg to return to a standing position. SLEEPING: If you lie on the side, you can use a pillow between the legs or put several pillows just in front of the bottom leg so the top leg can rest on them (especially for those who sleep between sidelying and on the stomach). If you lie on the back, you can place a small pillow under your knees if it helps your back, but be aware, the higher the pillows, the more weight it puts on your hips, especially if the mattress is soft. STANDING: Use your core, as noted above. Sometimes standing completely static keeps putting the same load on your hips, which may not feel good. So try making little circles with your pelvis over your legs (try doing a circle or a figure 8) while standing to help lubricate the joints. WALKING: Think about leading with your trunk not your legs. Picture a sprinter or a dancer, notice how their trunk leads, not the legs. 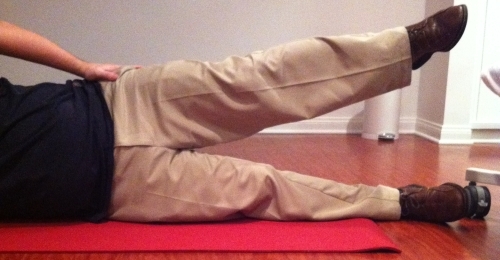 This increases your efficiency, power, and helps lessen the work required by the hips. Also, try walking backwards to train all of the opposing muscles which don’t work as much with forward walking. Just make sure your path is clear :)! You may consider a cane for balance or for mild weakness to increase support. A walker minimizes the loading on the hips much more, but the disadvantage is the increased demands of the upper body and heart. And as we all know, having good supportive shoes with cushioning and arch support can really help. AEROBIC EXERCISE: For so many reasons, it is important to do regular aerobic exercise. Consider what you do during the day and what type of exercise can balance those forces. For example, if you sit for your job, try walking for exercise. If you stand for your job, consider riding a bike (which is more like sitting). Aquatic exercise,- whether swimming, walking in water, cycling with noodles for support, or an exercise class can be great to help tone the muscles while minimizing strain to the hip joints. And of course, aerobic exercise and a balanced diet help to maintain healthy body weight, which is tremendously helpful in minimizing excessive loads on the hips. Hip pain is a very common problem, but the good news is that there is so much that you and I can do to overcome it. Hip pain can be experienced in the buttocks, side of leg, groin, inner thigh, and sometimes in the knee. If you have difficulty in walking, squatting, climbing stairs, crossing the legs, getting in and out of a chair or the car, or putting on shoes and socks, and you want to feel comfortable and strong, give me a call or shoot me an email. I will assess your hip thoroughly, as well as assessing the feet, knees, back, pelvis, or anywhere else that seems to be contributing to your problem. Call me for a hip pain treatment appointment!